At least 14 people were killed early Thursday in a U.S. attack on a western Baghdad neighborhood, police and residents said. The U.S. command in Baghdad said it was aware of the report but had no immediate comment. Some houses' roofs were caved in and other homes were completely destroyed in the early-morning attack in the Washash area, next to the Mansour district of Baghdad. "Three people were killed in that house," said a middle-aged man, standing next to a hole in his roof, as he pointed next door. He waved a piece of shrapnel he had found. "The Iraqi parties are quarreling over power and the people are dying," he told Associated Press Television News. "We are fed up." After a period of relative calm, there has been an uptick in violence in recent days as U.S. President George W. Bush prepares for a showdown in Congress over the future of the U.S. mission. 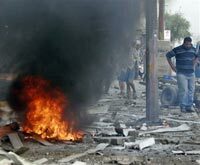 In eastern Baghdad on Thursday, a roadside bomb targeting an American patrol exploded in a neighborhood just west of the Shiite slum Sadr City. The area is a stronghold of anti-American cleric Muqtada al-Sadr's Mahdi Army, which he ordered last week to cease attacks for up to six months so he could restructure the militia. U.S. commanders greeted the declaration, but maintain that renegade elements within the Mahdi Army have disregarded al-Sadr's order and are continuing attacks on U.S. and Iraqi forces. The bomb injured four civilians and damaged a civilian car, and there was no immediate information on possible U.S. casualties, a police officer on condition of anonymity said. U.S. troops sealed off the area after the attack, police said. There was no immediate from the U.S. command in Baghdad.